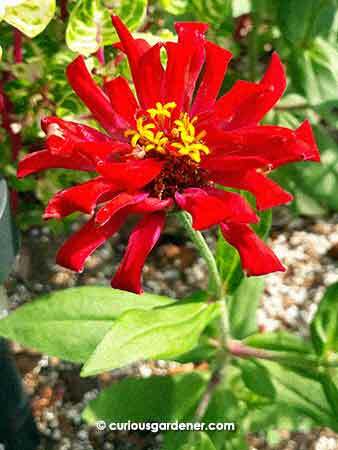 The red zinnia flower that became the apple of my eye. Some months ago, I went on a little flower-buying binge. 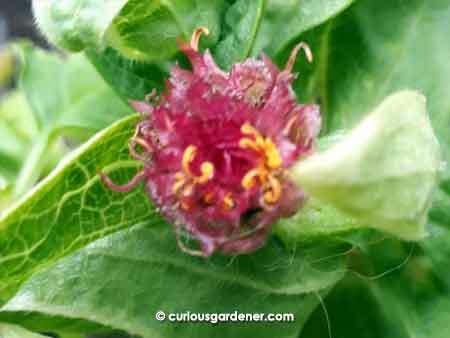 One of the plants that had caught my eye was the zinnia. 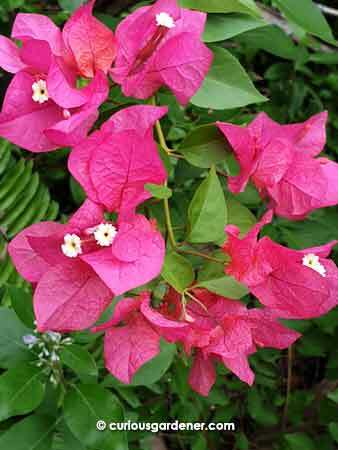 If you recall, I once grew that flowering plant years ago, and it had fascinated me because the composite flower was so visually interesting. Like nature, it “went out of season” with me after a while, so when I saw it at the nursery, I decided to buy a couple of plants – one red and one yellow, because the colours were so vibrant. 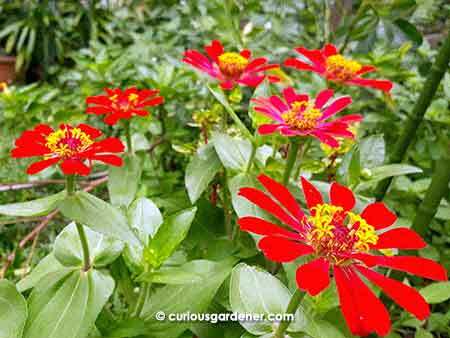 Don’t these red zinnias look gorgeous in a cluster? When I got home and spent more time with the plants, it wasn’t long before I fell head over heels in love with the red version of the plant. The way the red contrasted with the yellow centre was just too gorgeous. The yellow was pretty, but the entire flower was yellow – and it seemed to attract more pests than the red one (think of yellow sticky insect traps…). 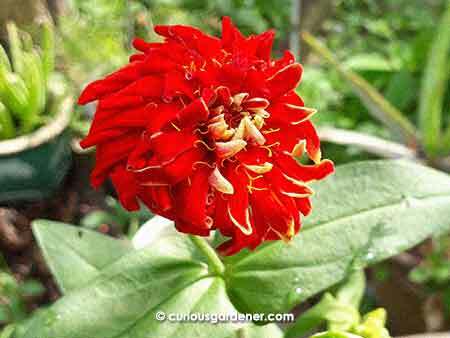 I was determined to keep growing red zinnias, so when the first flower had passed its prime, I left it to form seeds. I harvested the seeds when the flower head started drying up, and was delighted to get some fully formed, hard brown seeds. I planted them, and then because I hate to waste anything, I threw in the less matured seeds to mulch the ones I had sown. Guess what? A lot of them also germinated! I had a little forest of seedlings, and I planted them out. 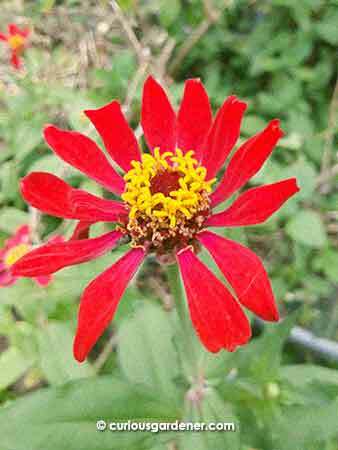 I call this the pom-pom zinnia flower – it has way too many outer petals, and no disc flowers in the centre! 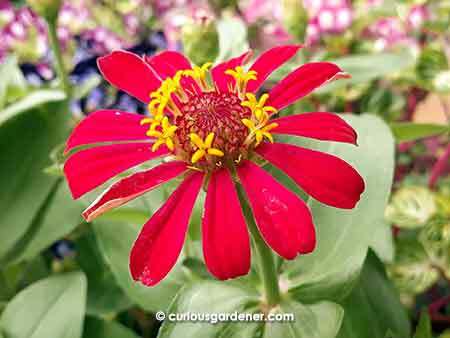 There’s only one thing to call this – a mutant zinnia flower! 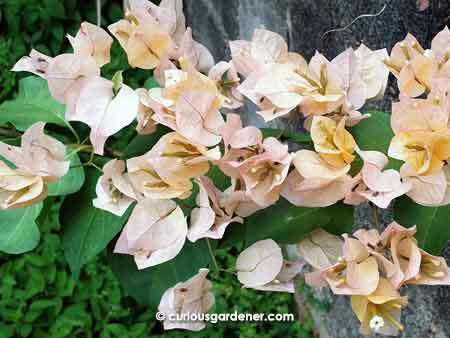 It had no outer petals, and didn’t form proper disc flowers in the centre. How bizarre! 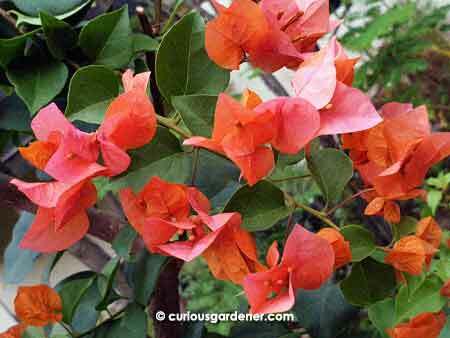 Lessons learned from this experience – use the best seeds and be firm in discarding the rest. 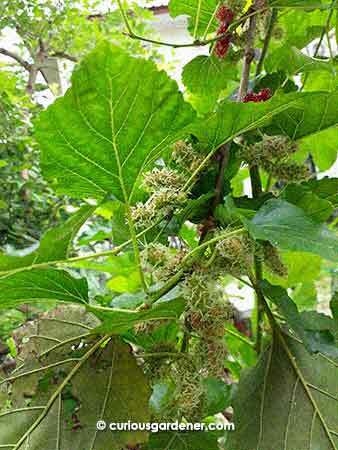 Although the second generation of seeds should be acclimatised to our garden, the quality of plant cannot be guaranteed. It was an interesting experiment, though! 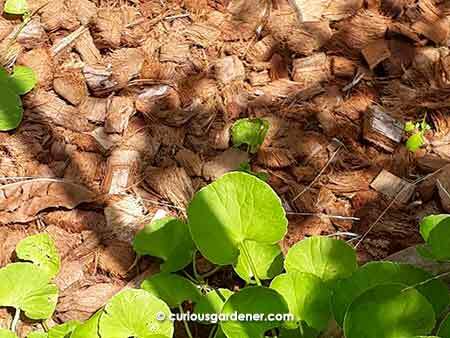 Coconut chips used as a layer of mulch will suppress weeds and keep the soil below moist. Our regular year-end rainy season seems to have ended, and the hot, dry period is about to hit us. It will get more pronounced in the next couple of months when the winds carry less and less moisture, and I’m already getting worried because I see how quickly the potted plants are drying out. It’s not just solar heat that will have this effect; a combination of wind and warm air will extract moisture most effectively. So this is when I usually start turning my attention to things like self-watering pots and heavy mulching. Taking measures like these means I don’t have to be overly anxious if I’ve forgotten to water the plants. It also means that we save water as well. Lately I’ve begun experimenting with coconut chips. These pieces of coconut husk act as organic sponges. My buddy Alexius uses them for his garden paths. 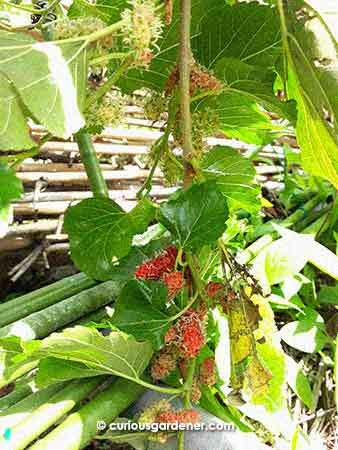 Not only do they suppress weeds, they soak up and hold moisture when it rains, and over time will decompose and provide nutrients to the plants. I’ve been mixing them into the soil of my potted plants to help with water retention, and am still working out the ratio for that. Recently, when I transplanted some young plants into a mixed planting in a large pot, I pushed in a large piece of coconut chip below each plant. I figured the chips would help to keep the roots hydrated, as well as feed the plants as they composted over time. Well, from the way the plants are growing now, I’d say it has worked! 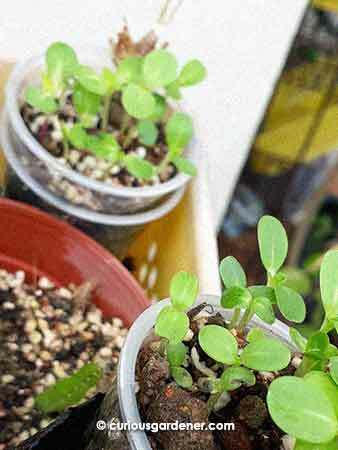 Healthy young plants that were transplanted with a big piece of coco chip below the roots to act as a “sponge”. Another way I use the coco chips is putting a layer at the bottom of potted plants to act as a barrier to keep the soil from escaping from the bottom of the pots. They also keep the moisture in, but I’ve found that this attracts ants to start nesting in the pots. I instinctively dislike seeing ants on my plants because they usually signify a pest problem, but I know that they also serve a purpose in the garden. However, the pest issue overshadows all else for me. 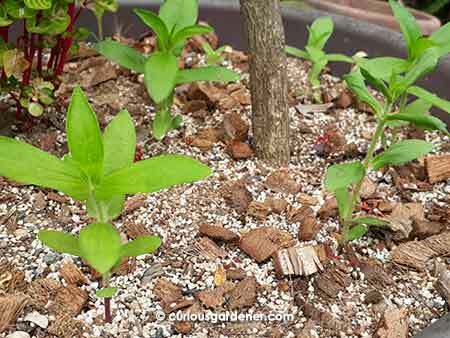 The final way I use the coco chips is as a layer of mulch. The only problem with this is that the chips are lightweight when dry, and will be blown away by wind, or will float to one side until they absorb water. So, you have to lay a decently thick layer and expect to lose some of it. 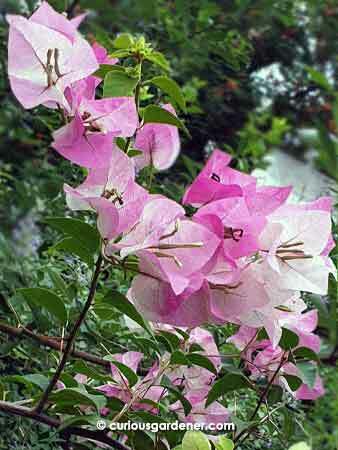 My humble opinion is that they work best when in the soil.